We are proud to host the best showcase around: GameDevs and VR exhibitors together in an incredible area: newGame(). newGame(), is the Codemotion’s brand dedicated to Game Development, that wants to keep contributing to the Game Development by delivering high-level content about every aspect of GameDev: not just coding, but also design, graphic, music and sfx, marketing and business. 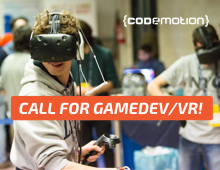 Apply to this call and grab the chance to get a free desk at Codemotion Rome 2018 on April 13th-14th. In addition, one selected team from Codemotion Rome 2018 will be invited to attend one of the upcoming Indie Prize events: Casual Connect Belgrade 2018 in September or Casual Connect Hong Kong 2018 in November. The call has closed March 7.